As viewers, we experience the film on several registers of subjectivity. 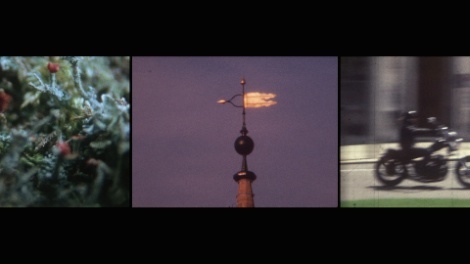 Whilst recognising the moving images as being the recorded memories of another, they seem familiar, and prompt us to recall our own memories in response; the sound of the Super 8 projector in motion projecting a spool of film, reminds us of the materiality of the images we see, located in the cinematic past. When we watch, we are drawn to the 'present moments' in the whole frame that is located within the central pane of the screen, experiencing the 'now' of the stream of moving image whilst being simultaneously aware of the partial frame to the right - 'the future' - before it occupies the centre and becomes present, then slips to the partial frame of 'the past' on the left before disappearing from sight.